SUNY Red + Blue Light Projector Add More Fun For Your House. Remote / AUTO / sound activated. Big Abstract laser patterns projected by a Mini Laser Light. Intelligent temperature control cooling system. Purpose: DJs, Bands, Bars, Pubs, Clubs, Roller skating rinks, Karaoke Room, Family party, Birthday party, celebration, Wedding party, Festival, Mall, Stock, Shop etc. Laser source: Red / Blue. LED Background Light: Blue Color. Warm up time: 0-3 Minutes. Projection Effect: Please refer to pictures. Cooling System: Intelligent Temperature Control Fan. Projection Distance: Up to 100M (in dark environment, brightness of laser may affect by other lights). Play Mode: Auto, Sound Activated, Remote Control. Laser Class: Class IIIa/IIIr; Projection Rate: <5mW; Certified by: FCC, FDA, CE and RoHS; This product is fully complied with the standard of the above Certificates. User Manual (English) x 1. 2. The pictures were made under the dark environment with foggy effects. 3. The item will be shortened it's life if it's keeping run for a long time, you are suggested to switch off for 15 mins when it was running for 6 hours. 4. Keep away from children and NO direct eye contact to the laser lights. 5. Please comply with the user manual during using. 6. It's normal for a little sound when the item is running as it was made with a stepping motor. 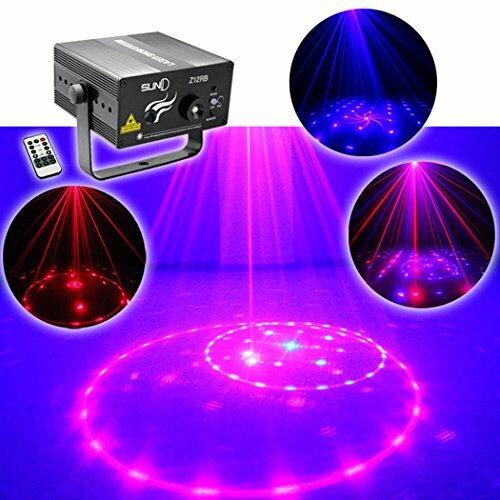 Use this light to light up for your house space or some professional occasion, like the living room, your little kids' bedroom, dance floor, family party, birthday party, holiday parties, X'mas tree, wall, DJs, pubs, clubs, stage shows, etc. Six-month Warranty; Excellent after-sale service. If you have any questions about this product by SUNY, contact us by completing and submitting the form below. If you are looking for a specif part number, please include it with your message.